The Bakugan Wiki is a free and independent wiki that covers the entirety of the Bakugan franchise, which anyone can edit. We have existed since March 11, 2008 and have over 5500 pages, containing content from the original Battle Brawlers to the ongoing Battle Planet, as well as the Japanese BakuTech series. For more information, see the latest news post. The latest episodes of Bakugan Battle Planet are episode 29 All Jungled Up, and episode 30, Outer Demons, which aired on March 2nd, 2019. The latest known release is Wave 3 of Battle Brawlers. This set been released in Canada and certain parts of the United States in the second half of March 2019. 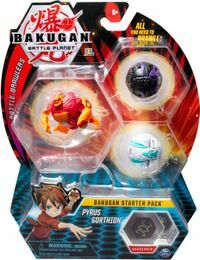 In addition, the second Bakugan card series, Bakugan Resurgence, has been released early in a small number of Wal-Marts.